Dr. Pagels will present on the Book of Revelation. Then, in dialogue with Dr. Timothy Beal, Professor of Religion at Case Western Reserve University, she will demonstrate the enormous influence of this book in Western culture and how it has played itself out in politics from the first century until today. Dr. Pagels’ recent book, Revelations, and Dr. Beal’s new book, The Book of Revelation: A Biography, will both be available for purchase. Drawing from her latest book, Why Religion? (to be released November 6, 2018), Dr. Pagels will share how she, given her relatively secular background, grew fascinated with questions about Christian origins and became an historian of gnosticism and early Christianity—and how that story is interwoven with events in her life that impelled her to ask the questions that she asks in her books. Here she will speak in a more personal way. Dr. Elaine Pagels is the Harrington Spear Paine Foundation Professor of Religion at Princeton University. A preeminent scholar of early Christianity, her many bestselling books include The Gnostic Gospels, The Origin of Satan, and Revelations: Visions, Prophecy, and Politics in the Book of Revelation. The recipient of a MacArthur “genius” Fellowship, a Guggenheim Fellowship, and a National Humanities Medal from President Barack Obama, she has also won a National Book Award and a National Book Critic’s Circle Award. Her next book, Why Religion?, draws from her own life to rethink our connection to the spiritual dimension of human experience. The Montview Distinguished Lectureship Series was established in 1957, and has hosted countless influential scholars and speakers including Reinhold Niebuhr, Paul Tillich, Marcus Borg, John Dominic Crossan, Anne Lamott, Teresa Fry Brown and Walter Brueggemann. Both November lectures are free and open to the public. Soul Shop is a one day workshop designed for church leaders, pastors, church staff, and lay leaders to help engage in understanding the dynamics involved in suicidal desperation, how to intervene and connect people to life saving resources, effective ways to minister to survivors of suicide, and how to address this sensitive subject in a manner that lifts up faith as a key element in moving out of a dark night of the soul to new life. Please find attached information on this workshop offering on Tuesday November 13, 2018. The event is being sponsored by The Colorado Council of Churches, Centus Counseling, Consulting and Education, Montview Boulevard Presbyterian Church, and Wellshire Presbyterian Church. Full and partial scholarships are available via funding from our sponsors and The State of Colorado Office of Suicide Prevention. Please do not hesitate to contact me with any questions you may have about this offering. Registration Fee: $50, with partial and full scholarships available, lunch provided. Montview Boulevard Presbyterian Church and Wellshire Presbyterian Church. Grace Presbyterian Church is hosting a Coping with Grief During the Holidays workshop on Sunday, November 11 at 12:00 pm-1:30 pm here at Grace. Licensed Professional Counselor, Sandra Hammond, will facilitate. More information, contact Justin Spurlock. The reality of life on the borderlands is much more complex and unjust than most people realize. BorderLinks offers experiential learning opportunities that explore the difficulties of migration and life along the U.S./Mexico border. This is an educational trip through interactive experiences. For complete information and application for scholarship, click here. Printable flyer, click here. Still have questions, contact Sheri Fry. All church leaders are encouraged to attend this morning of learning and engagement. Based on groundbreaking research with over 250 of the nation’s leading congregations, Growing Young provides a strategy any church can use to involve and retain young people. Stephen Ministry is a non-denominational care-giving Christian ministry that supports those who are experiencing a crisis, such as death of a loved one, divorce, major illness, or loss of a job. The Stephen Minister meets regularly with the Care Receiver, men with men and women with women, to listen in confidence as that person reviews his or her innermost feelings, thoughts and concerns. The Stephen Minister is not a psychiatrist, nor does he or she offer solutions to the Care Receiver’s concerns. Instead, the Stephen Minister presents a confidential ear that allows the Care Receiver to clear the mind of his or her innermost thoughts. St James Presbyterian in Littleton is sponsoring a Stephen Ministry Introductory Workshop on Saturday, November 3, from 9am to 1pm. It’s an excellent opportunity to learn more about Stephen Ministry and how your congregation can become involved. Those who attend will also experience a sample of Stephen Ministry training and learn care-giving skills they can use right away. The cost is $15.00 per person or $50.00 per congregation (four or more). To register, visit www.stephenministry.org workshop or call Stephen Ministries at 1 (314) 428-2600. Please join Presbyterian Women at Peoples Presbyterian Church, 2780 York Street, Denver, CO 80207. Service begins at 10:00 am. “Hidden Figures”: First the book, and then the movie, has inspired millions by revealing how hard working “human computers” guided and supported the development and implementation of the United States of America Space Program. Dr. Darden, a native of Monroe, NC, will share her faith journey and her career journey at the National Aeronautics and Space Administration (NASA). In her presentation, Order my Steps… she will share the challenges she faced as an African American woman working in an industry controlled by white males during the 1960’s, 1970’s and 1980’s. After five years of working as a “Computer” at NASA, she was transferred to an engineering section that worked on Sonic Boom Minimization. Her research centered around techniques to reduce the annoying sound that accompanies airplanes when they travel faster than the speed of sound. She has authored over 57 technical papers and articles, primarily in the areas of sonic boom prediction, sonic boom minimization, and supersonic wing design. Dr. Darden has been recognized with dozens of awards and honors—including two NASA Medals, one for her work and leadership of the Sonic Boom Program, and the other for her active involvement in working with and encouraging students to pursue careers in Math and Science. Dr. Darden, an ordained elder in the Presbyterian Church (USA), has served many areas in her local church, such as Chair of the Presbytery Council in the Presbytery of Eastern Virginia; as Moderator of the Synod of the Mid-Atlantic; as Vice Moderator of the General Assembly Committee on Representation, and as Co-Chair of the Advisory Committee for Social Witness Policy. In 2017, Dr. Darden was one of the “human computers” featured in the book “Hidden Figures,” and she has spoken to groups all over the United States about lessons to be learned in that movie. We are trying to raise money to purchase the missing 5th octave of handbells! Spread the word! Bring your friends! Tickets at the door, no pre-sales. Join Trinity Presbyterian Church as a partner with the host, Colorado Industrial Area Foundation (IAF) at a non-partisan assembly to present an agenda of issues affecting our families: education funding, affordable housing, humane immigration and refugee policies, and others. Palestinian Christian leader, professor, and author, Reverend Alex Awad has been an eyewitness to the political and spiritual developments in the Palestinian Territories. He served as Dean of Students at Bethlehem Bible College in Bethlehem where he was on the faculty for 24 years. The Presbyterian Peacemaking Program makes it possible for leaders from organizations around the world to visit the Presbyterian Church (U.S.A.) each year to interpret issues of peace and justice. All on-street parking in the surrounding blocks is free after 6:00pm. Surface lot across the street is $6. Join us September 29th and 30th for a workshop on faith and sexuality for kids and their parents. This workshop is an opportunity to discuss ways to open up communication as your child grows, moving from “the talk,” to an ongoing, open conversation about faith and sexuality. Our goal is to help your future conversations around puberty, adolescence, and sexuality within the context of faith, and learn to share your values as you talk about these topics with your child. Children and youth will have age appropriate discussion centered around the idea that all of life is a gift from God, and we are all made in the image of God. Childcare is available; rsvp to childcare@wpcdenver.org. Don’t miss the fundraiser concert for the Lomagundi Clinic in Zimbabwe sponsored by the Lomagundi Clinic Mission Partnership (Arvada, Genesis, Wellshire, and Wheat Ridge Presbyterian Churches) on Saturday, June 30th from 6:30-8:30 pm in our outdoor worship area (“gates” open at 6:00 PM). The band will be Nokuthula, which performs Afro-pop, fusion dance music from Zimbabwe and beyond! The proceeds will go to provide medical care for needy children in Zimbabwe. Cost is $15 per adult (12 and up) in advance ($20 at the door). Those 11 and under may attend for free. Purchase tickets in advance from LCMP members at Arvada, Genesis, Wellshire, or at the Wheat Ridge Presbyterian Church office 303-422-2345, Mon-Fri 9am-noon. People may bring a picnic meal or a hot pulled pork sandwich meal plus bottle of water will be available at the concert for $5.00 per meal. Do you have clothes in your closet you haven’t worn in years, but just can’t let go? Do you have outfits that make you feel spectacular and others that make you feel dumpy? It’s the same way with life. The attitude you choose to “wear” every day will affect how you feel, how you interact with others, and how well your day goes. We are going to get busy and clean some closets together with the goal of fully engaging in and appreciating every day. 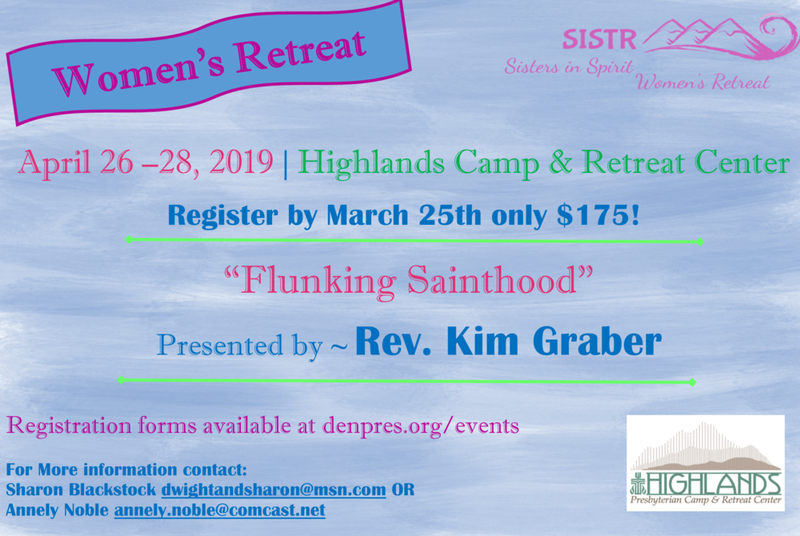 We hope you’ll join us for this wonderful women’s weekend that we promise will be incredibly fun and uplifting for your spirit! WHEN: April 28, 2018, check-in and breakfast begins at 8:00 am. Class starts promptly at 8:30 am and ends by 4:30pm. WHERE: Mountain View United Church, 10700 E. Evans Ave, Aurora, CO 80014. We have ample free parking! REGISTRATION: There are only 25 places available for this training, so registration is accepted on a first-come- first-registered basis. Send an email or call Mountain View United Church’s Director of Mental Health & Inclusion Ministries, Amy Petré Hill at amy@mountainviewunitedchurch.org or 510-967-4890. Please include your full name, home address, congregation or organization, phone number, email address (so we can send a reminder and additional info), and any special dietary needs to Amy by April 23. Join Central at March For Our Lives - Denver! We will gather at 1pm on the church steps at 1660 Sherman. Parking available in the Wells Fargo Garage at 1700 Sherman. Buy a validation ticket for $3 at Central. Enjoy delicious corned beef and cabbage, homemade soda bread, baked potato bar and dessert. A winter wander into the mysteries of Creation and the rhythms of solitude, enchantment, and deep imagination. Wednesday, January 24th from 9 am - 4 pm. Donation: $45 per adult. You are invited to a time of Sabbath rest and renewal in the nurturing community of fellow pilgrims in Creation as we participate in the winter rhythms of wild discipleship during this season of Epiphany. Rediscover your own innocence, wonder and wisdom as well as your deep capacities for imagination and artistic vision mirroring the inner terrain of soul and outer landscapes of the land. Through parables, poetry, and contemplative practices you will learn practices from the Celtic and indigenous Christian traditions for accessing and cultivating treasure hidden in the field. Suicide and gun violence affects everyone in our communities, including the church. Many churches have responded with their own resources or in partnership with a few other churches. We can raise the level and scope of the conversation and involvement by including pastors, youth & family educators, and adult volunteers in our local churches who want to be involved but don’t know how.